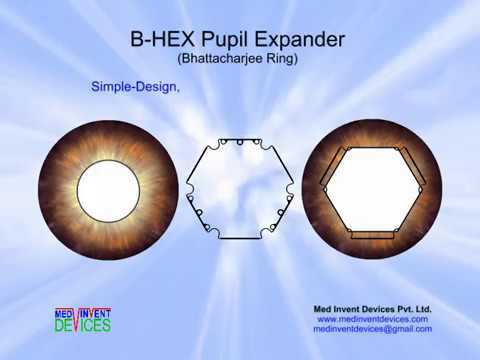 How is B-HEX® different from other pupil expanders? Pupil Expanders - Is Hexagon better than Square? 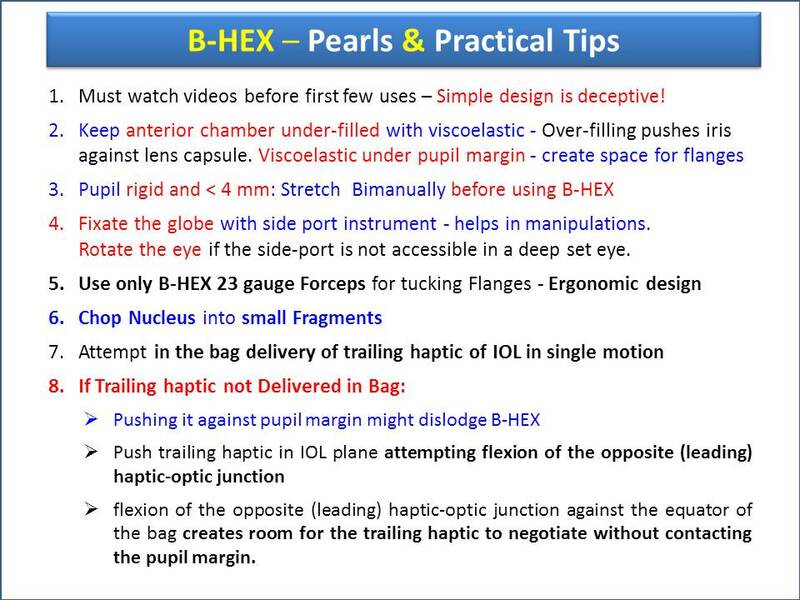 Join ‘B-HEX Pupil Expander’ on Facebook - Experts provide hand holding support! Would you like to recommend a modification in design or usage of B-HEX®? Do you have a new idea? We could collaborate! The B-HEX® is the 3rd generation ‘Bhattacharjee ring’ and superior to any available device as it uses a radically different inventive step (see below). It is a uniplanar thin flexible hexagonal device with notches at the corners and flanges at the sides. Alternate flanges with positioning holes are tucked under the iris to engage the notches to the pupil margin and provide pupil expansion. The single use disposable 6.5 mm device provides a 5.5 mm expanded pupil which is adequate for phaco surgery and IOL implantation. It is preloaded in an innovative transparent housing with a handle which presents the sterile device at the incision. The surgeon effortlessly slides the device into the anterior chamber using the B-HEX 23 gauge Micro-forceps. 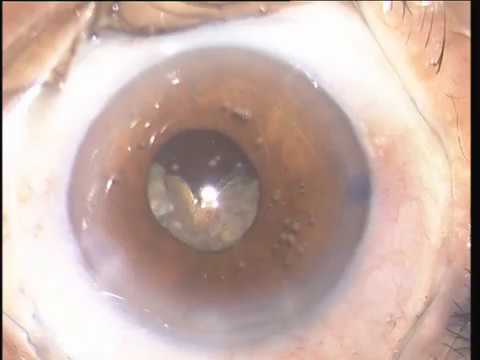 The B-HEX is clearly visible to the surgeon during its entire travel from the housing through the incision into the eye. All other pupil expanders have scrolls, channels or pockets which makes the pupil engaging part a thick biplanar structure. 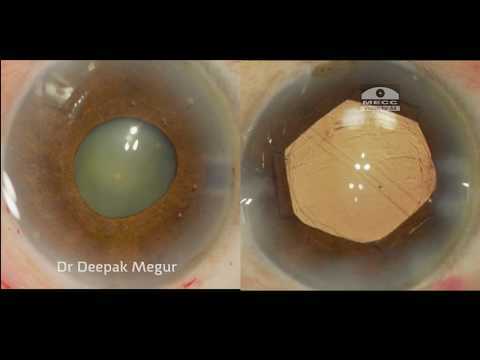 This is difficult to pass through a slit corneal incision and causes snagging. Hence all these devices require an Injector for delivery and removal. The B-HEX® on the other hand has a thin profile and uniplanar design that allows it to glide through much smaller incisions without an Injector. The B-HEX® takes advantage of the fact that the Iris can be reversibly bent without harm. We would like to do everything to make your B-HEX experience even slightly better. Please write to us if you have a suggestion regarding any aspect of the B-HEX design or usage and we will try our best to incorporate the same. And we will acknowledge valuable suggestions. Irrespective of your background, if you think you have an idea that could benefit ophthalmic surgeons or our patients we would be happy to hear from you. Please do not share any confidential information or information that may be subject of intellectual property without signing a Non-disclosure agreement (NDA)/ Confidentiality agreement with us. We could send you a NDA on request. Our team will examine your idea and let you know if it interests us. Thereafter we may look into the collaboration options.